All regular Guild meetings will be held on the fourth Thursday of each month at Church of the Advent, 510 Mount View Avenue, in Colwood (Victoria, BC) unless otherwise noted. Day and evening meetings will be alternated as follows. At each meeting a program is usually presented. Please bring goodies to share if your last name begins with the initials listed after the meeting date and time. Thanks! Note: Meetings, sewing days, etc. are fragrance free, please! 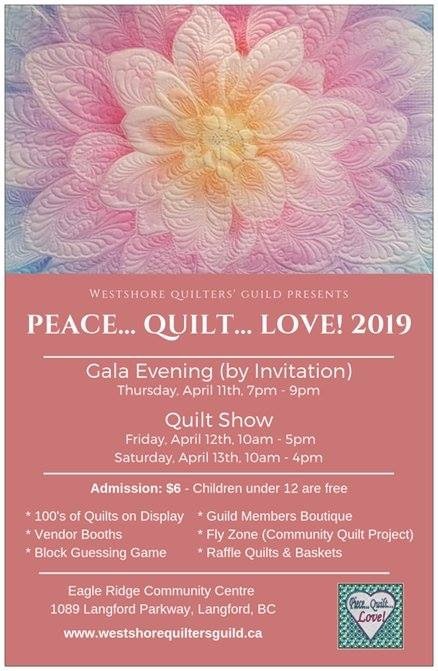 Program: Post Quilt Show and perhaps a surprise speaker! Decorate, bling and glam your WQG blue bag for a chance at prizes. Cindy’s Threadwork’s has generously ofered to sponsor the prizes.